I got a free download digi image from Shelly's Images blog of the autumn fence scene. I did alter it slightly by printing it in reverse and adding the pumpkins. Printed it out on white cardstock and painted it with Daniel Smith watercolors. 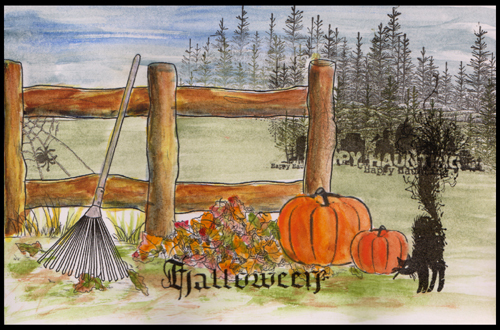 All stamped images except for the fir trees (Stampscapes) and the word Halloween (Quietire Design latest Halloween stamp sheet) are from Inkadinkado. Repeatedly stamped the fir trees in the background with Versafine Black Onyx (masking the fence). Then stamped the Happy Haunting grave yard scene also with the black. Drew in a spider web with a micron pen, then went over it with a Quickie Glue pen and sprinkled Ritz micro fine glitter "Stardust". Stamped the spider. Stamped and clear embossed the black cat. Stamped and clear embossed the word. Wonderful coloring! Thanks for joining us at Kaboodle Doodles Leaves Challenge! Beautiful card! I just love that scene!! Fabulous! Very seasonal, YThanks for joining us at Rainbow Lady.ogi. Your card looks really fantastic. Thanks for playing along with us at Stamps & Fun = Creativity. A stunning autumn scene and a great freebie image -I might have to get this myself! Well first, let me say Happy (late) Thanksgiving there in Canada, and keep warm - the snow will be flying soon if it's not already! You were so lucky to win this digi for free, it's really pretty. And your watercoloring - WOW. I could never do that. Thanks SO much for joining us this week at Wags-n-Whiskers. I wanted to mention that Wags-n-Whiskers has several digi images and rubber stamps in the shop (link on the blog page) that you could watercolor. I hope you will check it out, and THANK YOU for joining us for this challenge. Beautiful scene and gorgeous colouring,thanks for joining us at Cupcake this week. Very great card - love the image! Gorgeous work, love all that attention to detail to create such a fab scene! Thanks for entering our Fall/Halloween challenge over at Fussy and Fancy and good luck! What a fantastic scene you've created its fabulous! Never heard of a micron pen before...! Thanks so much for joining us this week over at Kaboodle Doodles and good luck. What a fun creation! Very nice image, love your design. Thanks for sharing at Scrap Creations. Good Luck! hugs, Frances. Lovely Autumn scene. Thank you for sharing with us at Rainbow Lady's this week. I say frame it!! Beautiful! You are a natural at watercolor too! Beautiful scene! Thanks for playing along at Fab N Funky's fall colours challenge this week! Such warm and lovely colours! Thank you so much for entering this project in our challenge at SFTW and good luck! A great card, thanks for joining us at Rainbow Lady's this week. Pretty scene card! love the colouring. Thanks for joining us at ALPHABET Challenge Blog. Good Luck!! Thank you for sharing with us at CES Challenge & Delightful Challenges this week, good luck!